Over the last few years, the ServiceSpace London community has been blossoming in many different ways with all kinds of Awakin Circles, retreats, local kindness events, Karma Kitchens, conferences and more -- laddered by a committed group of local anchors. 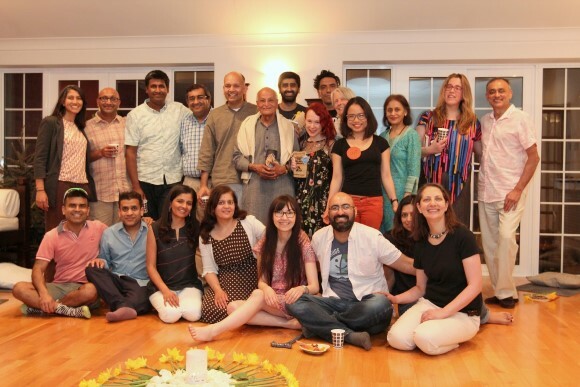 Last Friday, this group of ladders came together for a rich deep-dive circle with Satish Kumar and Nipun. Our intention was simply to embark on a journey together as a community of noble friends, who can nourish and inspire each others' journeys of service in different ways and put our hearts together to pay it forward to others. In that spirit, ahead of the circle, we offered a few readings as seeds for our conversation, which included Make Virtue Viral, Holding Space for People, Gifts of a Servant Leader, The Ripple Effect of You, and Power of One. The sunshine and warm weather graced our beautiful evening as we circled up to explore how we can individually and collectively deepen and grow in our journeys of service. "How can I love more?" "I'd rather be a happy nobody than a unhappy somebody." "There is no one without the other." "I want to bring my values to work with me." "My health condition is a gift - I can't go anywhere fast and that gives me the space to notice small things." "For this year, I'm letting go of two words: disappointment and service." "Does service begin at home? I think so. That's why I'm not moving away from my parents home so I can serve them, as reluctant as I feel about it." "First I want change myself, before I think of changing others." "We created this mess in the world, and we need to figure out a solution together. We are the ones we've been waiting for." Felicity, a life-long teacher of troubled youth, shared how coming into Ani's Awakin Circle held her during the toughest phase of her life. Vicky added, "I walked down the stairs after the first ServiceSpace retreat, and knew that life would never be the same again. It hasn't." At Museum of Happiness, Shamash wants to continue to proactively integrate ServiceSpace values and practices into all their events. Following our circle of authentic shares from the heart, Satish Kumar offered his gratitude to the circle for the "monsoon of love" that filled all of the reflections and offered a few seeds of inspiration and wisdom from his own journey. "There's nowhere to arrive -- life is a pilgrimage, it's a process of growing and deepening," he reminded us as he humbly shared that now at 81 he's still on a journey, "I'm still a pilgrim." He invited us to open our hearts to each other and the world around us and learn to see all sides as "two sides of the same coin" and encouraged us to live each moment in life in a deeply aligned way which honors our deepest intentions, a process of remaining detached and fully engaged with our life's work. Nipun has deepened in his own service journey through both inner and outer growth, and as his journey deepens he's noticed a shift from seeing content to seeing context, which is all the conditions and interconnections underlying the content which are integral to it's existence in a sense. "Can we see a cloud in this sheet of paper?" Nipun shared a beautiful quote from our friend Yuka in Japan: "When you see more, you need to do less to create impact." One question he's holding is who do I need to be to hold space and serve others and their entire context in an authentic way? He shared Zilong's story of the intentions he held while on his cycling pilgrimage and how he wanted to cultivate virtues in his own heart so that those who served him on his pigrimage would receive the most merits from their acts of generosity. "He's receiving but in the process of receiving he's giving, and he's giving by purifying himself." We can purify ourselves through the act of serving others and we grow different kinds of roots when we grow through service. The web of affinities that is formed as we serve others is a source of resilience that enables us to take steps to purifying our hearts. "I am able to deepen to the degree that I've done the inner work and the outer work -- the outer work of creating those affinities by serving others and the inner work of unraveling my own selfish tendencies." We're deeply grateful for the opportunity to serve together with noble friends. 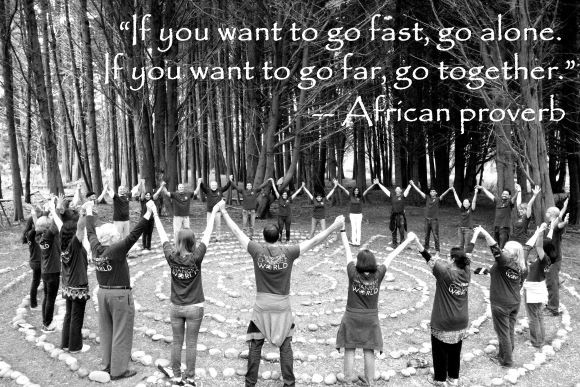 As Ram Dass once said, "We are all just walking each other home." Seems like London friends had another beautiful gathering. The balance between inner and outer work needed for deepening is a great reminder. was a joy to read this!